We’ve been home almost a week now, and I think I’m finally caught up. I find this rather interesting. When I worked I was a very “like clockwork” type person. I was my own energizer bunny and didn’t sit down until all that needed to get done was done. I was current on everything and quickly worked through whatever needed to be done. Plus on many nights and weekends I brought work home, and was able to accomplish that also. Now almost 1 week later I’m just getting to that point of being caught up, yet I feel I have been very busy. Have I slowed down that much already? Am I taking more breaks than I realize? Am I watching more TV then I should? I didn’t think I was, but why then are things not getting done? I have noticed some things I am doing so maybe this is what has led to this week catch up. Sleeping in later than I probably should, but I feel I deserve a little catch-up on the sleep thing. Keep getting side tracked. I am working on one thing. Walk into another room to get something that I need to finish what I was working on, and while in the other room I start working on something new. All of a sudden an hour is gone and I still didn’t finish the first thing. Definitely spending more time cleaning the house. I did take care of our house when I was working, but I can tell you it has never been cleaner than now. It seems that every day I’m finding myself cleaning something that probably didn’t need cleaning, but I thought what the heck, get the cloth and clean it. This is one activity that I’m glad I started as I did feel I could have been doing a better job, but there was never enough time. I find myself walking around the yard. Enjoying the flowers and seeing if anything needs a trim or a weed pulled. Amazing how much time this can take up. Going to the grocery store during the day. This is an adventure for someone that has never shopped except for the evenings and weekends. Just like everyone seems to be on a mission driving to work and back, shopping was like this too. Working Mom’s, busy parents, they went to the grocery store with their lists, filled their carts and left. Nope, not weekdays, grocery shopping is an adventure and could take hours. I haven’t yet been able to control this, I’m still in my previous shopping mode – in and out, so this one is going to take some getting used to. Meeting friends for lunch. It is so amazing to sit and have lunch and not have to look at your watch to make sure you’re back to work within your allotted hour lunch time. It’s just wonderful! Well, that’s where I’m at now. I haven’t gotten into any routine yet, and I know I need to, otherwise a month will be going by and I’ll wonder what I have accomplished. I still need to start my diet and exercise routine, and I need to set some type of schedule for getting things done. Jumping around like a jumping bean will lead to lots of things getting started but nothing finished. I am still amazed that I seem to be making this transition so smoothly. I have no regrets about leaving my job, I’m not bored, I’m not sad, but actually happy, and I seem to be totally enjoying “me” time, something that I’ve overlooked for years. I am so glad I have taken the time now and have chosen this new road I am traveling. Until next time have fun traveling your chosen road. I’m a few days behind on bringing you up to date, so here I go. We left the Chicago area on Friday morning and drove to Jefferson City, MO. You say, why Jefferson City? There are no direct Interstates that go there, it is sort of out of the way for the big city destinations, but we chose Jefferson City for one reason, and that was to take the Missouri State Penitentiary tour. 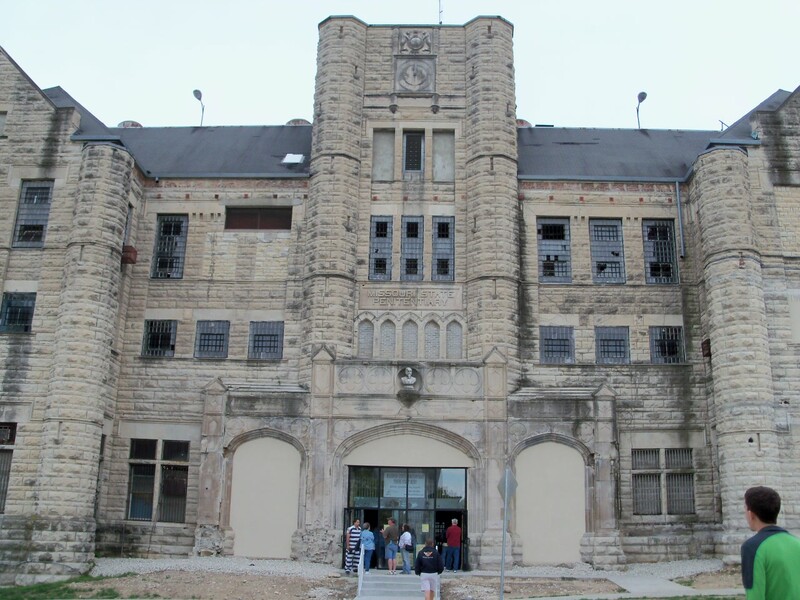 Now we all have heard of Alcatraz, but I had never heard of the Missouri prison until I started reading about things to do in the state of Missouri. Befoe I go on I will say that it was worth the extra time and distance to travel to Jefferson City. 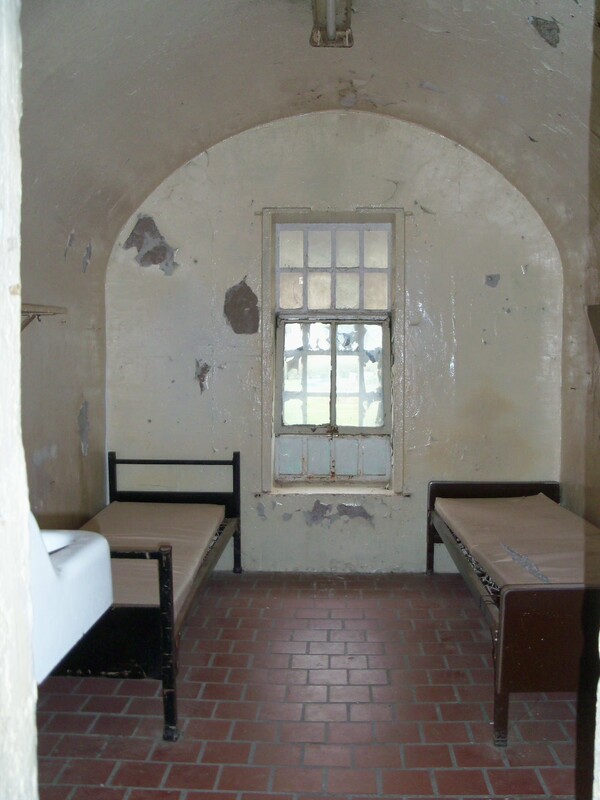 The Penitentiary was decommissioned in 2004 and moved about 7 miles out of town to a new faciity. The day we were there they were celebrating the 175th anniversary of the prison. To help correlate the year it was opened, the Battle of the Alamo ocurred in 1836 and that is when this prison was open, amazing. The Alamo is still standing and so is this prison. Regrettably the Penitentiary has not had much financial support and has been exposed to the weather conditions so it has fallen into disrepair. It is my understanding that portions of it has been torn down and there is an ongoing discussion of what to do with the facility. Once you get by the raw condition of the buildings listening to the history and picturing what it was like you can get lost in the moment. We had an excellent tour guide, Mike. He was one of the previous wardens of the Penitentiary, how can it get any better. He was a wealth of knowledge and had some funny stories, and also some rather sad ones also. I could have listened to him all day. 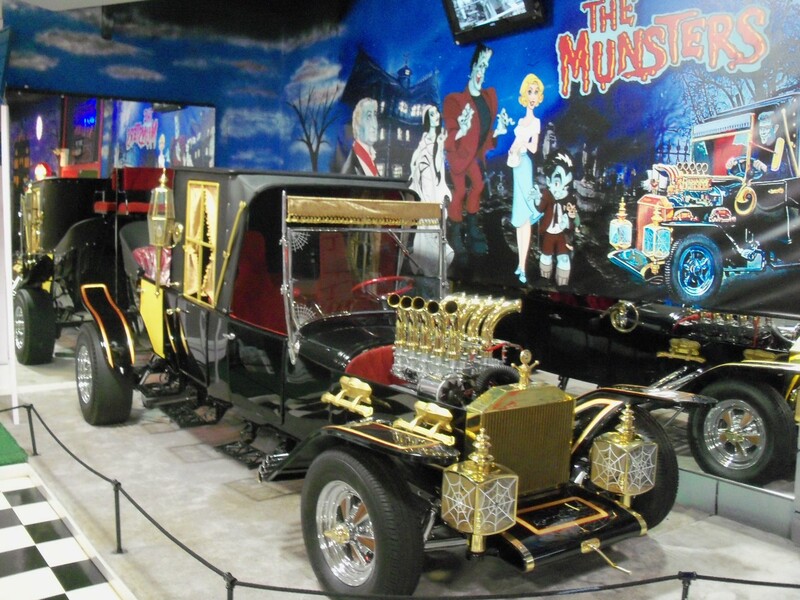 We took the 2 hour history tour, but there is also a 3 hour history tour, and starting in 2011 they now do ghost tours. I’m really sorry we missed the ghost tour as that sounded like lots of fun and really scary. I believe they have “sleep over” tours, but I would suggest you inquire about this as I’m sure advance reservations are needed and they are only at certain times. We were able to see 2 cell blocks, one built in the mid-1800’s and the other built in the early 1900’s. Much of the presentation was how prison life has changed over the years, and how prisons were built back then and the changes in building style that occurred. The conditions were deplorable, that’s all I can say. This prison had some famous inmates such as James Earl Ray, and Sonny Liston. In addition to the cell blocks we also saw the “buried cells’, or as I would say the dungeon, and also toured the gas chamber. This Penitentiary did execute 40 inmates during it’s lifespan. What’s also amazing about this Penitentiary is that it housed up to 5000 inmates at one time, while Alcatraz never exceeded 800. It gives you an idea of the scope of this place, the conditions that existed. If you stood still and closed your eyes while our tour director talked you could actually imagine what it was like. And I can tell you imagine is all I would ever want to do. Some of you might be saying now, why would I go see this. From my viewpoint, it is a part of history, it was extremely educational and I can certainly tell you that if you were on the edge of committing a crime, once seeing this facility it might make you rethink your direction in life. If was one of the most infomative and enjoyable tours that I have taken and I know much of that was because of our tour guide, he made the tour excellent. Now, there is one other place you should visit while in Jefferson City and that is the Missouri State Capitol. It is a beautiful building and what is unique about this building compared to other Capitol buildings is the artwork. The Capitol was completed in 1917 and is in downtown Jefferson City, only about 7 blocks to the Peniteniary. On a nice day it is walkable. When the Capitol was built they issued bonds. They were able to complete the building with an excess of about $1 million. Since this could not be refunded they used these funds to acquire artwork both in the building and on the grounds. They have tours from 9AM to 5PM daily (except for lunch) and it is free, it’s about 55 minutes. Once the tour is completed you can walk around the building and go back and look at the artwork in more detail. You can visit the Capitol without taking the tour, but the tour guide provides details that you would not get on your own. Jefferson City is not a large city but they provide a very good Visitor’s guide that I’m sure you can look at on line also. I hope you consider Jefferson City as one of your future destinations or stop overs, and do hope you enjoy. Check for schedules as this part of the country does get cold and it does snow. I will be posting some photos shortly. Take care and continue traveling safely down your road you are traveling. 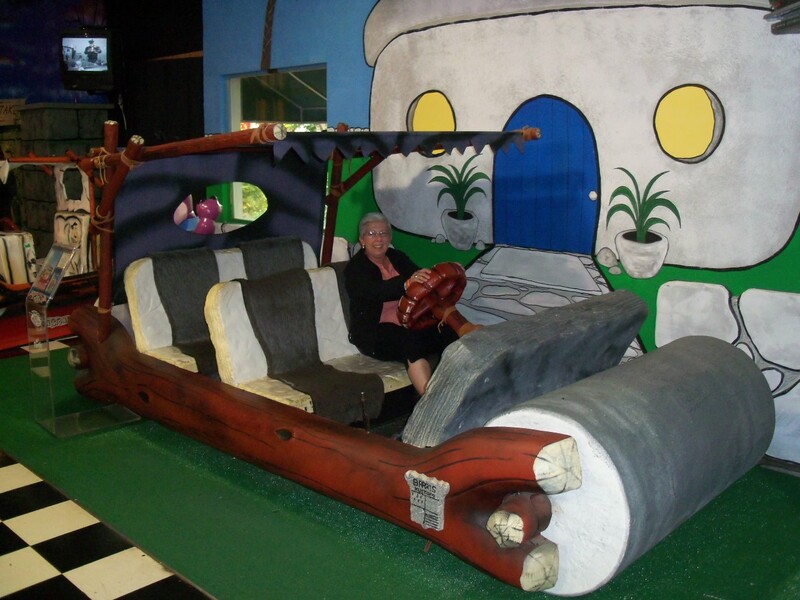 Flinstonemobile – could resist the photo op! 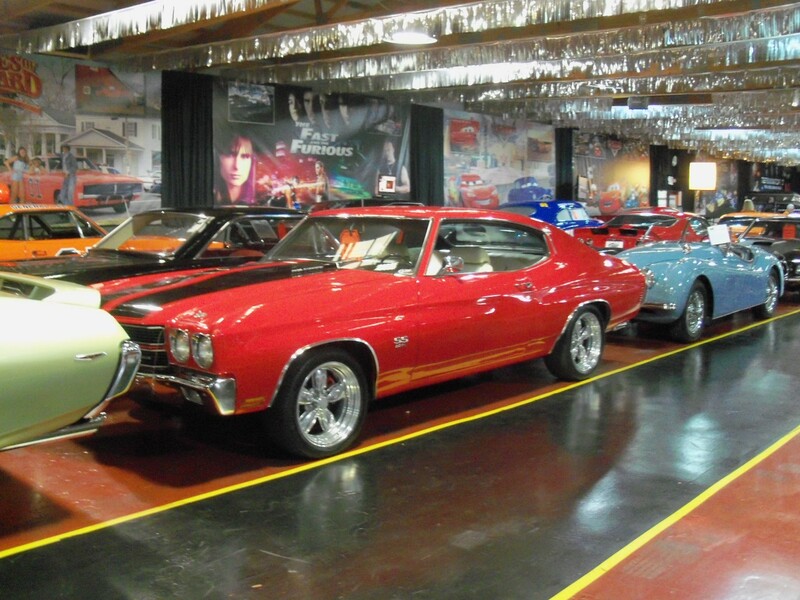 These are just a few of the cars at the Volo Antique Auto Museum in Volo, IL. This is a far North suburb of Chicago. 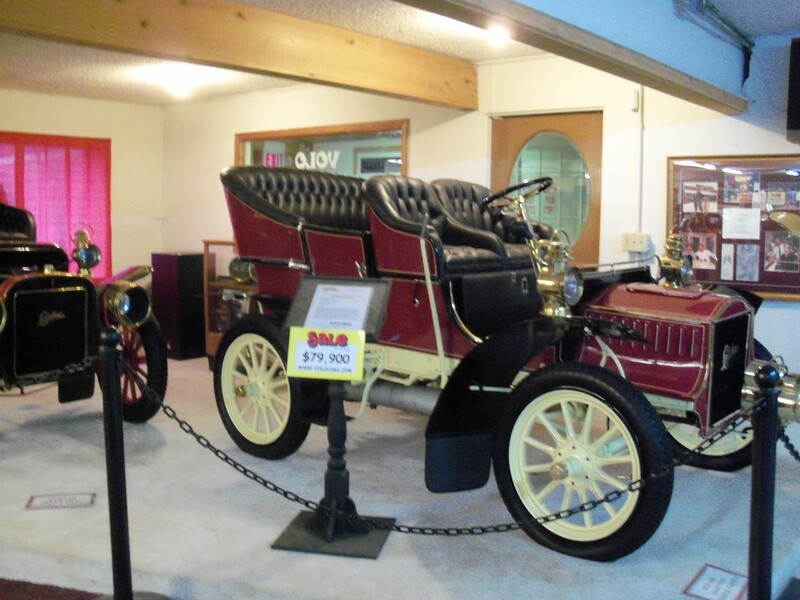 In addition to the photos they have a lot of antiques to look at. 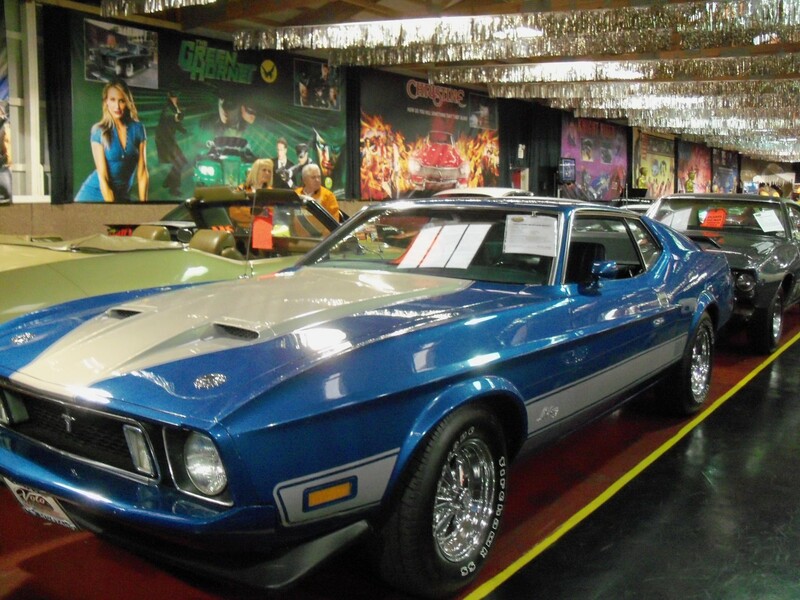 So if part of your group wants to look at cars and the other look at antiques there is enough of each to keep everyone busy. It’s well done and I think you would enjoy your time visiting. They do have a diner for lunch, but you get a wrist tag, so if you have time, about 1/2 mile away is a fast food restaraunt where you can go and have a good Chicago Vienna hotdog, or Italian Beef. If this is your first time in the Chicago area, please try the Vienna hotdogs, this is truly Chicago. The place is called Fratello’s and I don’t think you would be disappointed, this is a good lunch spot. Have fun if you go. Tonight we were in Joplin, MO after spending the day in Jefferson City, MO and I’ll give you the update in the next post. Saw some intersesting things and can’t wait to tell you about them. Also have some photos to share. So until the next post we’ll be on the road traveling towards Texas.